President Donald Trump made a promise to 94-year-old Sgt. Allen Jones after inviting him up on stage at an event hosted by the Kansas City Veterans of Foreign Wars in July 2018. The president was quick to agree. 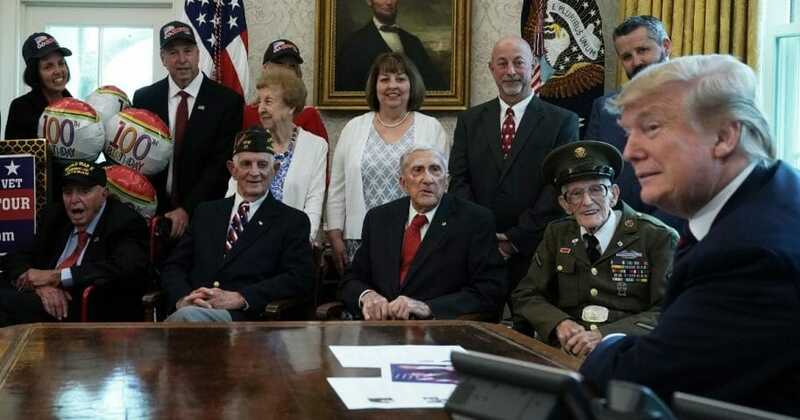 On Thursday afternoon, Trump made good on his promise by hosting Jones and three other distinguished World War II veterans in the Oval Office to celebrate the serviceman’s 95th birthday. “Beautiful afternoon in the Oval Office today with a few great American HEROES!” Trump said in a tweet featuring a clip of his original interaction with Jones, as well as video from his time with the veterans and their families on Thursday. Alongside Jones were Floyd Wigfield, Sidney Walton and Paul Kriner — each over the age of 100. According to The Virginian-Pilot, 101-year-old Wigfield was, like Jones, lucky enough to also be granted a presidential promise. He has requested to ride on Air Force One this June following the 75th-anniversary celebration of the successful Allied invasion of Normandy on June 6, 1944. As of 2018, as few as 496,777 of the 16 million American veterans of the Second World War are still alive, with more than 370 passing away each day, according to the National WWII Museum. Veterans like Kriner, Wigfield and Walton have made it their personal mission in recent years to travel the country informing Americans about the struggles, sacrifices and victories of the WWII generation. Meanwhile, Walton is on what he calls the “National No Regrets Tour” on which he intends to visit every state and raise awareness of the “diminishing number of WWII veterans” in the United States.